This window can be used to configure Webcampak system settings. Usually those settings are confgured once for all and never modified during the product lifetime. Inidicate the name of your main network interface, this is used to generate system stats. Timezone where your Webcampak is physically located. 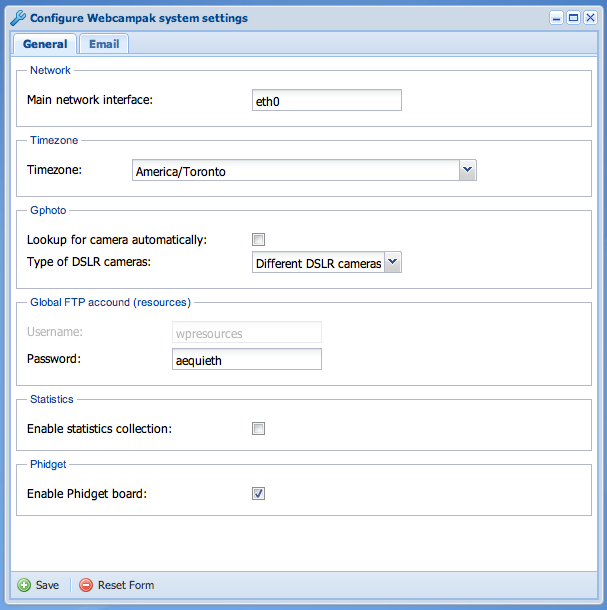 Webcampak configuration in a multi-camera setup is a complex implementation and is only compatible with some DSLR cameras. Activate this module if you connect multiple DSLR cameras via USB to Webcampak. Then indicate if those cameras are identical (same brand & model) or different. Webcampak must be able to understand how to assign a camera to a source and ensure this configuration is maintained whatever happens (camera reboot, webcampak reboot, ...). As mentioned previously, each source get assigned a dedicated FTP account. This "wpresources" account is a global account that can be used to access Webcampak system-wide resources (excluding sources content). cache directory, containing temporary files. You can delete all files within this directory in case of major issue. This module is used by Webcampak team to estimate how often our product is being used. Thanks for participating.